The Berry Burn wind farm currently has 29 turbines. A second proposed extension of one of Moray’s largest wind farms has been described as a “nail in the coffin” for the region’s tourist industry. Initial plans have been lodged with the Scottish Government to expand the Berry Burn development south of Forres. The wind farm is already one of the biggest in the area, with 29 operational turbines – each about 325ft tall. 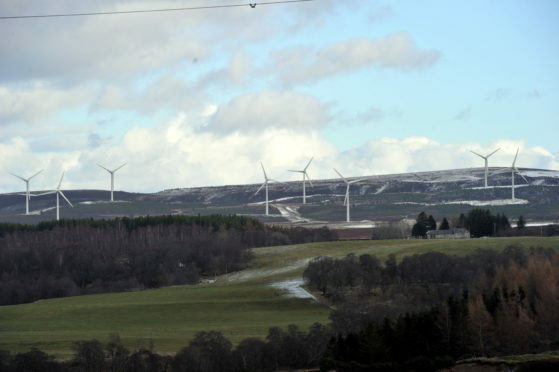 They already dominate the landscape, some seven miles from the town, but now developers Statkraft and Airvolution have lodged documents with Holyrood’s energy consent unit (ECU) to say they are considering a further 10 turbines at the site. Each would be more than 150 feet taller than those already in use. The announcement follows separate proposals from Force 9 Energy, that could eventually lead to 47 turbines, up to 575ft tall, almost encircling the existing development. Airvolution has stressed the plans are at an early stage and have pledged to consult local residents and groups about the development. However, anti-windfarm campaign group Scotland Against Spin fears that if firms continue to target the area it could result in irreparable damage. Chairman Graham Lang said: “These latest plans represent another nail in the coffin for the tourist industry in the area – and further proof of the unsustainable renewable-driven energy policy. It is estimated that the extension to the Berry Burn wind farm will generate enough electricity to power another 30,000 homes every year. Ordinarily a development that size would be submitted to Moray Council instead of to the ECU. However, Airvolution has explained that due to the plans being considered an extension, the combined capacity with the existing turbines pushes it over the limit to be sent to the Scottish Government. Last night, Brian Higgs, chairman of Finderne Community Council, explained they would launch consultation events of their own to come to an opinion about the proposals. He added: “We’ve only discussed this so far with regard to how we’re going to gather views from the community, so we haven’t come to a position on it yet. A spokesman for Airvolution pledged there would be “numerous opportunities” for locals to have their say during the planning process. He added: “We think there is potential to extend the Berry Burn Wind Farm and have submitted a scoping request to the ECU of the Scottish Government as an early step in evaluating this potential. “A scoping request provides the ECU, Moray Council and other consultees an opportunity to note their views on issues that should be included in an environmental impact assessment.